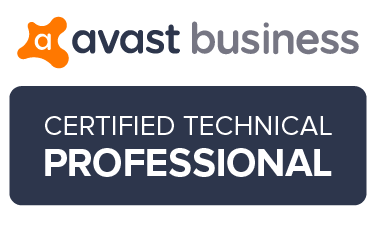 Avoiding or Remove MalwareBytes Trial Version - Custom Computers, Inc.
For all users of MalwareBytes you should be aware of this situation. 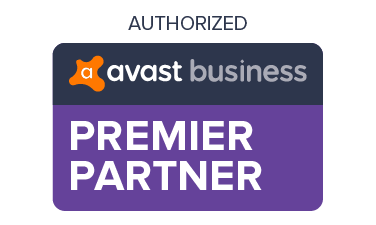 Of course MalwareBytes offering a free version they do need to get paid somehow so they will try to upsell you in to paying for the Pro version of the program. 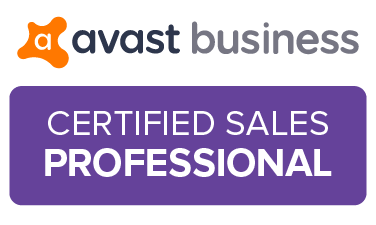 Let me first say that if it is working well for you and you feel it is worth buying the pro version they please do so as they work hard at keeping up with new viruses and malware which are released 24x7x365. If you want to keep the free version then be sure to follow the below instructions. Once in a while MalwareBytes will put an update to their program out and upon doing your normal update it pops up and says “The latest version of MalwareBytes has been downloaded.” and yes you want to update your program but you need to pay special attention to be sure that during the install process of the update you un-check the box that offers a free trial version of MalwareBytes Premium. If you do not un-check this box it will automatically install the trial version then after a set amount of days the trial will expire and you will then get messages constantly about it being expired so be sure to un-check the box when you get to the screen with the “FINISH” button as pictured below. One caveat here for the user is: if he download and installs free version, then actually Trial will install unless he observe and unchecks ‘Enable free trial of Malwarebytes Anti-Malware Premium’ during installation. 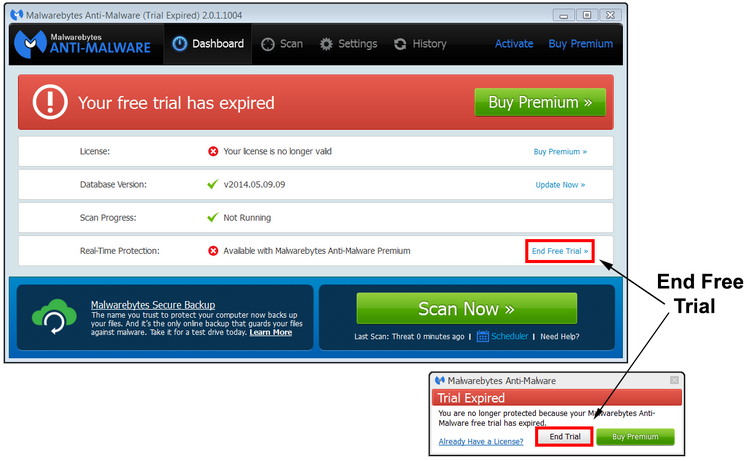 Note: When the evaluation period was over, you’ll get a popup or notification conveying message ‘Trial expired, You are no longer protected because Malwarebytes Anti-Malware free Trial has expired’, you’ll be presented with options to ‘End Trial’ and ‘Buy Premium’ (check the screenshot below), then click on the former one. If you’ve noticed you’ve installed the trial and want to get back to free one without uninstalling, here is how that can be simply done. 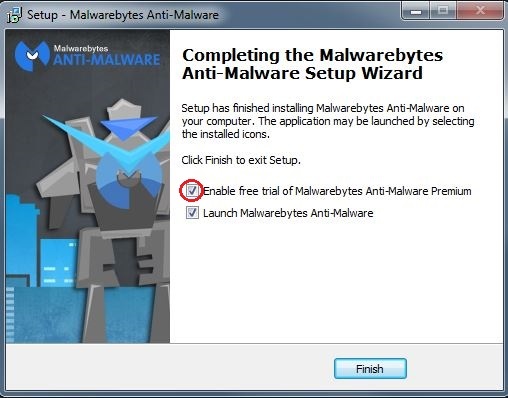 Open Malwarebytes, and on the Dashboard, click on ‘End Free Trial’ link which, then will be instantly converted to the free version.